What Defines a ‘Cleanroom’ Product? A simple definition is one that, via its proper materials and construction, will allow the cleanroom to operate within its designated standard of cleanliness. There are several standards, domestic and international, that apply to different industries, e.g. electronics, biotech, pharmaceuticals, etc. And, within each of the standards, a range of cleanliness levels are categorized. 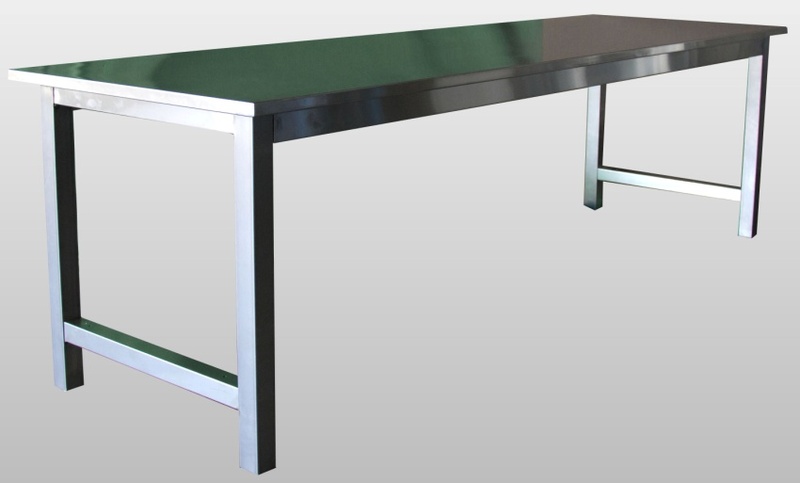 Generally speaking, tables, benches, workstations, carts, shelving, etc. used in higher standard cleanroom environments will be constructed of 100% stainless steel – either 304 grade, or the more ‘pure’ (and more expensive) 316 grade. In some extremely sensitive areas, an electropolish finished may be specified, to further reduce the risk of potential corrosion, which causes airborne contamination. For more ‘moderate’ standards of cleanroom performance, alternative, less expensive materials can be appropriate. For example in a ‘Class 1,000’ room, it’s not uncommon to specify stainless steel worksurfaces supported by powder coated steel bases. 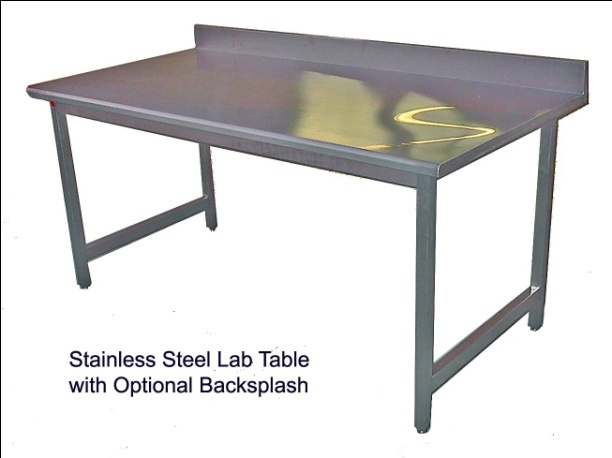 For class 10,000, plastic laminate (HPL) worksurfaces with under-seals may replace stainless steel. This will often apply to ‘controlled’ environments as well, which include some level of HEPA air filtration but have not been designed to perform to a rated standard. These benches are beautifully crafted, U.S. made and designed for optimal performance & aesthetics. This series is offers design flexibility to meet varying cleanroom and/or other controlled environment requirements. Stainless steel over `core´ (medium density particle board with cleanroom underseal), for optimal strength. 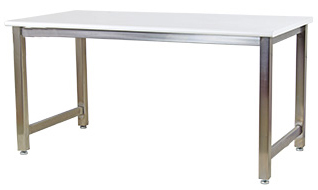 Solid top stainless steel gowning bench. Ships knocked down. 14 gauge 304 stainless steel with rolled front edge. 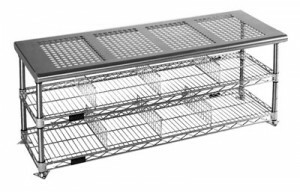 Low cost wire rack gowning bench available in chrome or stainless steel. Ships knocked down. Undershelf gowning bench models –Stainless steel top available as perforated (shown) or solid. One shelf standard. Second shelf and dividers optional. Ships knocked down. 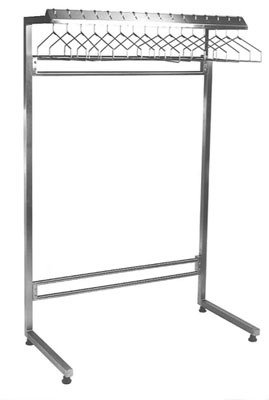 Free standing & wall mounted gowning racks for cleanrooms. Various sizes. Contact usfor details, pricing, etc. Wire rack cleanroom workstation available in stainless steel or chrome. 62% open airflow. 800 lb. load capacity. 33”H worksurface. Cantilever shelf. 100% 430 Stainless Steel storage cabinet. 24”D x 36” or 48”W. Three shelves, adjustable on 4” centers. Available with slanted top for laminar air flow. Additional shelves available. Mobile wire rack cleanroom computer workstation available in stainless steel or chrome. Specify 24”x24” or 30” x 30”. Mouse pad optional.